Making the most of your contractor marketing efforts requires a bit of relationship building and a lot of commitment to your brand. When you combine these two elements, the rest will come naturally. As a contractor, you should see your customers as seasonal consumers with year-round needs. Because your pool of potential buyers operates largely on a needs basis, it’s your job to help them understand why they’ll need you before they start shopping for another company. Thank your customers. A simple thanks can go a long way. Thank you cards give your customers tangible evidence that you appreciate the fact that they chose you over the other guy. People take notice of thank you cards, and they’ll remember you when it’s time to refer your company to friends and neighbors. Enter their inboxes. There’s a huge difference between personalized emails and spam that goes right to the junk box. If you tailor your electronic messages to each individual consumer, they’re far more likely to pay attention to what you have to say. Address each email personally, and make sure the content of the text is relevant to each individual you’re speaking to. Survey customers’ satisfaction. You’re far less likely to get feedback from your customers if you don’t ask for it. Facilitate the process of feedback by providing quick, easy-to-fill-out surveys that will allow you to gauge what you’re doing well and find opportunities where you could service your customers better. Testimonials talk. People pay attention to what other consumers have to say. When your marketing collateral includes testimonials from true customers, you’re giving your business more credibility. Give yourself every opportunity to collect awesome comments that you can use on marketing collateral. This is just the tip of the iceberg! Ready to learn more? 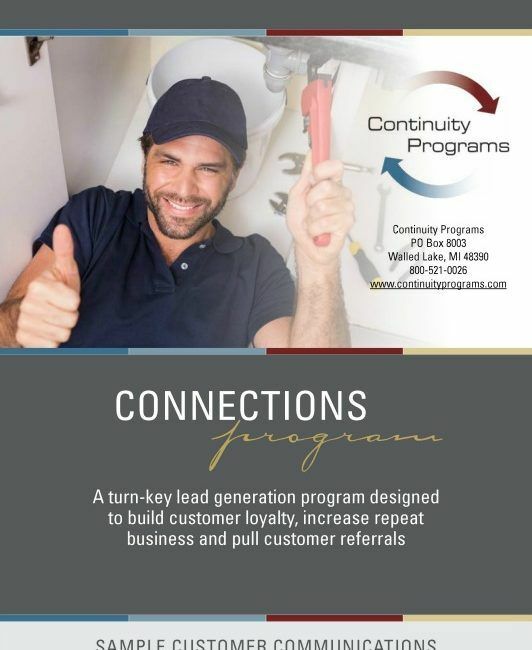 At Continuity Programs, contractor marketing is one of our specialties. 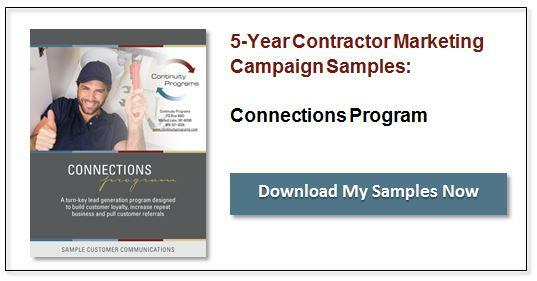 Download and review our five-year campaign samples!